This Saturday saw the annual running of the Bearnagh race. This short course classic starts in Happy Valley taking in the peaks of Meelbeg, Bearnagh and Meelmore before finishing across the stream from where it started; well normally it’s a stream but today it was more of a white water experience. After heavy overnight, and early morning, rain the weather had cleared up a bit for the start. The race took off heading for the peaks shrouded in mist. As expected Willy McKee and Zak Hanna led the charge with Colly Murtagh sitting somewhere between them and a large group containing Sam Herron, Alex Brennan, Colm Campbell, Deon McNeilly, Thomas Leith, Pete Grant and Richard Bell. Deon led his group over the top of Meelbeg and into the first of the three descents. The run down to the foot of Bearnagh is technical, or in other words rocky, at the best of times, but the overnight rain had made it reasonably treacherous. Some runners were throwing caution to the wind more than others. Once again Zak, Willy and Colly led the way up Bearnagh. 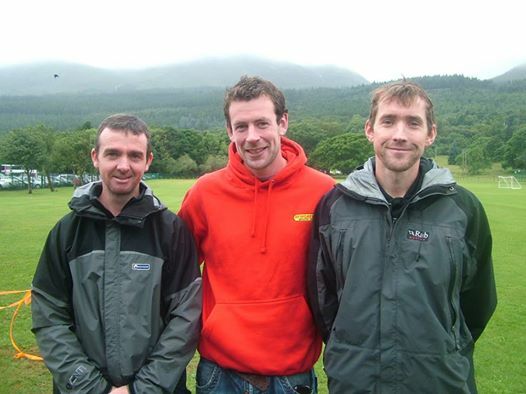 Next onto the mountain was Colm Campbell, followed by Sam and Alex. A short stretch behind Thomas, Pete and myself were doing our best to embrace the steep and, let’s face it, unpleasant climb. Zak was first over the hill followed closely by McKee then Murtagh. In the chasers Sam ‘I love the steep stuff’ pulled away from Alex and Colm. Everyone else was still slogging there way up. At this point Zak headed for some mythical track which he claims leads you straight to the foot of Meelmore. If I ever see it I will let you all know. It’s ordering zyban online safe to say Zak hasn’t seen it either and he went awol in the mist at this point gifting the lead to McKee. In the chasers Grant was running down Bearnagh like he was on the mythical track and was now in touching distance of Campbell and Brennan. Willy McKee led the race over Meelmore. Judging by times he was nearly at the bottom of it by the time Colly and Sam, 2nd and 3rd respectively, got to the top. Brennan, Campbell and Grant were tussling for the next places. After a superman dive by Campbell on the descent Alex was able to run in for 4th closely followed by Colm then Grant. In the ladies race Megan Wilson led from start to finish. Shileen reports that at the top of Meelmore Megan had a 20 metre gap. Shileen was chasing hard but unfortunately for Mrs O’Kane Megan disappeared into the mist. Even after climbing and racing for umpteen years Shileen could not engage her inner sat nav and actually climbed back up the hill to wait for someone who could guide her down. Mari Troeng followed in third place. The weather may have been downbeat but once again the Mourne Runner’s put on a good spread in the hillside marquee. All of the team baked and bought the goods, but a special mention should be made for Beverley Herron. Leading up to the event I had talked of making history by demolishing more of Bev’s fine buns than any challenger, but Shileen redeemed herself by coming out the clear winner; of course a man never talks about what a lady eats.